We are celebrating 5 years of the Visualizing Birth blog! There could be no better time to write about local artist Shauna Wiley-Naefke’s stunning work, Maternal Bliss. Shauna’s paintings always utilize vibrant tones and remarkable composition to capture images of pregnant and birthing bodies, and Maternal Bliss is another example of this combination (see also Shauna’s Labor for Love and Birth Partner for more representations of her style). 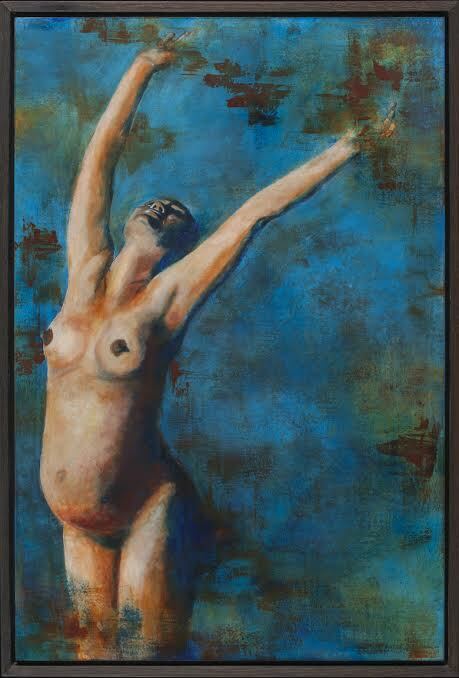 The artist’s use of blue, green and brown colors in the background complement the warm tones of the female form. Her unique technique of blending the colors across the canvas, similar to glazing, adds a timeless element to the image. As for the composition, the arched back and outstretched arms of the central figure create a full curve across the background. Interestingly, this curve almost adds a fecundity to the blue colors touching the woman’s form, as if the sky itself were pregnant. Shauna used an image of a friend to paint Maternal Bliss, and the work represents one of the artist’s first paintings on the topic of pregnancy and birth. While paying tribute to the rites of passage of pregnancy and birth, Shauna also normalizes these events for her viewers. Maternal Bliss is helpful in the visualization of birth, reminding others that pregnancy is not an illness or a weakness, as often portrayed in our culture. Instead, pregnancy and the nurturing of life within have the capacity to generate new vitality and energy in the female body. Shauna Wiley-Naefke is a Bay Area artist located in Alameda, California. In addition to her own experiences with the births of her two children, she has attended other births as a doula. Wiley-Naefke has shown her work in California and has a special interest in painting scenes of pregnancy, birth, and babies. Commissions of these and other subjects are welcome, and the artist is also always in need of models to take pictures of for her work. More of her artwork may be viewed through her Facebook Page and she may be contacted through email at: s.naefke [at] gmail [dot] com.